This obliging bird was observed at Kerio View near Iten, Rift Valley, Kenya. January 2012. Ebony head, upper chest, back and tail contrast sharply with rusty orange lower belly. There's also a white patch in the wing. In older texts the bird is called simply Cliff-Chat. 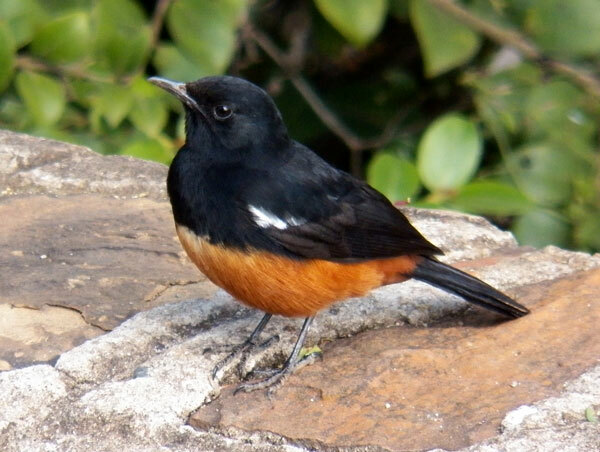 After a white-crowned population in West Africa was split off as a separate species the remaining population was then renamed as Mocking Cliff-Chat. Copyright Michael J. Plagens, page created 27 June 2012.